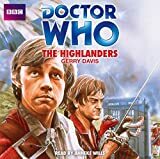 In the aftermath of the Battle of Culloden four Scots - Alexander McLaren (William Dysart), Jamie McCrimmon (Frazer Hines), their injured Laird Colin McLaren (Donald Bissett) and his daughter Kirsty (Hannah Gordon) - take refuge in an abandoned cottage. The TARDIS materialises in a nearby glen. Its occupants emerge and narrowly avoid being hit by cannon fire. Shortly afterwards they are captured by Alexander, who takes them to the cottage and prepares to put them to death as camp followers of the Duke of Cumberland. Kirsty, believing that the Doctor can provide medical help for the Laird, wins a stay of execution. Ben produces a pistol that he found outside and turns it on Jamie and Alexander. The Doctor asks Kirsty and Polly to fetch some water with which to clean the Laird's wounds. He also extracts a promise from Jamie and Alexander that they will not attack him and his companions. A sceptical Ben obeys the Doctor's instruction to put the pistol down, but as he does so it goes off. The sound attracts a group of Redcoats. Alexander tries to lure them away but is shot dead. The soldiers storm the cottage, and their Lieutenant, Algernon Ffinch (Michael Elwyn), orders that the occupants be hanged immediately. Two men watch from a short distance away as the soldiers make preparations for the hanging. Solicitor Grey (David Garth) muses on the fact that the battle has so far produced few prisoners. He has given up a successful legal practice to become the Commissioner of Prisons. He reveals to his secretary Cedric Perkins (Sydney Arnold) that he has made a deal with a slave trader captain, Jebb Trask (Dallas Cavell), to sell the rebels for transportation to the West Indies as slaves. Polly and Kirsty, on their way back from fetching the water, spot the Redcoats at the cottage. They watch as the prisoners have nooses placed around their necks. Polly decides to create a diversion by throwing a rock down the hill. The soldiers spot the girls and some of them, led by Ffinch, give chase; they have heard rumours that Bonnie Prince Charlie is attempting to flee the country dressed as a woman. Ffinch's Sergeant (Peter Welch) prepares to carry out the execution but is again interrupted, this time by Grey and Perkins. Grey demands that the prisoners be given up into his custody and, after receiving a bribe, the Sergeant agrees. Polly and Kirsty hide in a cave. Kirsty tells Polly that the prisoners will be taken to the gaol in Inverness. They pool their valuables to see if they have anything to sell to enable them to buy the men's freedom. Kirsty has a ring but refuses to give it up, claiming that her father would kill her if she did so. Disgusted, Polly sets off on her own. As night falls she becomes frightened and begins to run. The ground gives way beneath her and she falls into a deep pit. Kirsty, who has followed, attempts to help her out, but falls in too. The Redcoats arrive in the area. Ffinch is furious that his soldiers have failed to capture the girls. He orders them to return to the cottage to fetch his horse. Polly and Kirsty then lure him toward the pit and he falls in. Polly grabs his gun while Kirsty relieves him of his food and money. They warn him that if he should send his soldiers after them they will make him a laughing stock by telling everyone that he was captured by two girls. Leaving him behind, they climb out and make their way toward Inverness. Ffinch is finally rescued some hours later by his Sergeant. At Inverness gaol the Doctor discovers that the Laird has the Prince's standard hidden under his clothes and removes it. He then tells a guard that he needs to speak to Grey urgently. He is taken to the solicitor, who has been discussing with Trask the arrangements for loading the prisoners onto the Cornishman's ship, The Annabelle. The Doctor claims to know where the Prince is, showing Grey the standard as proof. The distraction allows him to steal a pistol. He ties Grey up and forces him into a cupboard before making good his escape. Ben, Jamie, the Laird and the gaol's other prisoners are placed in the hold of The Annabelle. There they meet Will MacKay (Andrew Downie), a fellow prisoner, who was once the ship's master. Trask, his former mate, betrayed him while they were running weapons to the rebels past the English blockade of France. Polly and Kirsty have made their way to Inverness where they pose as orange sellers in the hope of obtaining information about their friends. They are spotted by the Sergeant, who forces them inside the local tavern to see Ffinch. The Doctor is also present, disguised as an old woman. Polly greets Ffinch as 'Algy' and instructs him to tell the Sergeant that he has mistaken them for someone else. The embarrassed Ffinch orders the Sergeant away. The girls question Ffinch about the fate of their friends and he tells them that they are Grey's responsibility. Perkins enters the tavern and Ffinch introduces him to the girls, explaining that they wish to see Grey. On the ship, Grey offers the prisoners three choices: be hanged, turn King's evidence or sign up to work in the colonies for seven years. Everyone except MacKay, Ben, Jamie and the Laird signs up. Grey orders that the four be taken off and hanged. Ben seems to have a change of heart and asks if he can read the contracts first. Grey agrees, but Ben then rips the contracts up. He is knocked out by Trask. Furious, Grey snarls that once he has returned with new contracts Ben will be tied to the highest yard arm and drowned. In the tavern, Polly and Kirsty decide they have waited long enough for Grey. They make to leave, but Perkins threatens to call the watch unless they stay for a game of whist. The Doctor finally gives up his pretence of being an old woman and pulls a gun on Perkins. Grey returns but, failing to realise what is happening, heads straight for his room, calling Perkins to follow. The Doctor warns Perkins to say nothing and orders him to remain at the table while he and his friends escape. The girls take the Doctor to a barn that they have been using as a hideout. Polly suggests that they hijack The Annabelle and sail it to France. Kirsty dislikes the idea, but the Doctor tells her that it would be much safer for a few years. On learning that the girls still have some of the money that they took from Ffinch he tells them that they must buy weapons and a rowing boat from the English soldiers. Polly and Kirsty have only limited success in this but the Doctor fares much better, returning with a barrow load of weapons. The Doctor recognises Kirsty's ring as belonging to the Prince. Kirsty admits that the Prince gave it to her father in thanks for saving his life and the Doctor tells her that it is right and proper that it should now help to save her father's life. Ben is hoisted from the deck of The Annabelle and dropped into the water on the end of a rope. When the rope is pulled up again he has disappeared. He swims to the jetty only to be met by an English soldier. Luckily it is the Doctor in another disguise, keeping the other soldiers at bay while he loads a rowing boat with the weapons. Ben explains that he escaped from the rope using an old Houdini trick. The Doctor outlines his plan: Polly and Kirsty will row him out to The Annabelle where he will distract Grey while they get the guns to the prisoners. The Doctor climbs over the side of the ship and is captured and taken to Grey. He shows him the ring and tells him that the Prince is one of the prisoners in the hold. Grey, Trask and Trask's crew take him down there and he leads them into the middle of the apparently sleeping prisoners before identifying Jamie as the Prince. The prisoners suddenly jump up, armed to the teeth. A battle ensues in which Trask is killed and the Highlanders gain control of the ship, which they then make ready to sail to France. Perkins offers his French skills to the rebels and remains on board, while the time travellers return to shore in the rowing boat, taking Grey as a hostage to get them past the English soldiers. Jamie stows away with them and when discovered helps them find their way back to the glen where the TARDIS landed. When they reach land Grey manages to escape. Needing another hostage, they return to the tavern to find Ffinch, who is playing cards with Colonel Attwood (Guy Middleton). The Doctor shows the Colonel the ring and tells him they need Ffinch and his men to help them capture the Prince. The Colonel orders Ffinch to aid the Doctor and his friends. The travellers arrive back at the glen, only to be met by Grey. Ffinch has learned of Grey's illicit scheme, however, and orders his men to arrest the solicitor. With the soldiers and Grey gone the travellers prepare to leave. Jamie accepts the Doctor's invitation to join them.